After continuous tests, completions and thin options the manufacturer of cars from Germany presents on a showroom in Frankfurt the serial version of 918th Spyder – the car combining the enviable expense for any midget car with power of a racing sport car and this car is one of the best hybrid sports cars ever made, and it’s a Porsche! The effective hybrid engine united in itself impossible – 3,3 liters of fuel consumption on 100 kilometers of run and 887 horsepower’s of capacity. Also it is all in suitable for daily trips on public roads the car with a demountable plastic roof. On it advantages of the car of “blue blood» at which in genes the sports habit of mark esteemed in motor racing is put do not come to an end. The spider with an index 918 is capable not to spend at all some combustible fuel, “reeling up” on the odometer figure more than in 30 kilometers only on electric energy. Moreover, without resorting to the help eating gasoline 608 HP V8 with volume of 4,6 liters, low and aerodynamically perfect car can execute speedup from a place to 100 km/h less than for 7 seconds, spending only a charge battery lithium-ion. The transmission design – the powerful gasoline engine with the electric assistant actuates a rear axle, and one more 126 HP electric motor transfers a twisting moment to front wheels. Moment distribution electronics, as well as a steering corrects, capable an angle of rotation to choose for wheels individually, repeatedly raising confident stability at passage of high-speed turning movements. Five modes of behavior of three engines united in one car is permitted to choose to the helmsman. E-Power – soft and sedate, to 150 km/h without harmful blowouts and to 32 kilometers of run; Hybrid – ball impartial electronics which conducting a combination of work of three motors corrects urged greatest possible to save fuel; Sport Hybrid – a high-speed mode with an interdiction of switching-off powerful V8 with two electric assistants “on demand”; Race Hybrid – the racing mode where the battery is charged in braking time, and at speedup is given all power of three motors without looking at economy; Hot Lap – it is accessible in mode Race Hybrid, with peak kickback of all possible resources of the car on button pressing a wheel. The power battery consisting of 312 elements, for the purpose of life cycle increase is shrouded by a water jacket maintaining optimum temperature at operation. Guaranteed for work in a current of seven years the accumulator is charged from the household 230-volt socket connection for 4 hours, and at more powerful energy source on a total charge it is required less a half an hour. The compromise for tires, it is equally confident providing clutch with any road carpet, Porsche developed together with eminent Michelin. On 918 Spyder for a lobby and a rear axle the different size of tire covers – 265/35 ZR 20 and 325/30 ZR 21 accordingly. Inside sports style the premium of a class united with comfort, including a steering wheel with set of buttons as the racing car, a creating cosines climate control and qualitative musical system with a pure volume sound. 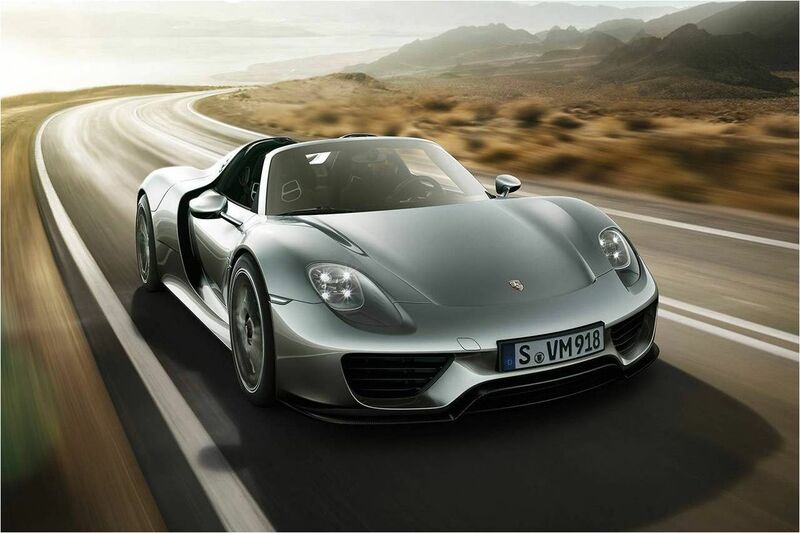 In December 2014 manufacturer informed total of 918 cars coming on sale. The car price begins from 991 300 euros. 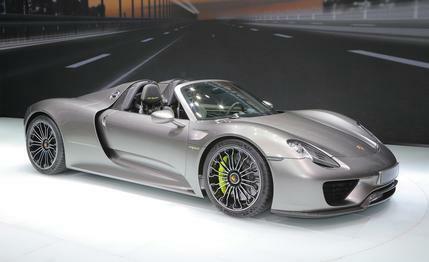 *Exact cost of Porsche 918 Spyder can be obtained from the nearest dealers of Porsche in your area.